Will Manipur witness a replay of the 2015 protests? Manipur Chief Minister N Biren Singh has announced that his government will be introducing an Inner Line Permit (ILP) Bill in the monsoon session of the assembly. According to reports, the Bill will be discussed first with all the stakeholders in the valley and the hills, before it is presented. The ILP system was first introduced by colonial administrators in Assam through the Bengal Eastern Frontier Regulation, 1873. The statute sought to keep the 'wild tribes' in the hills from raiding the revenue generating plains by restricting movement between the hills and the plains. However, post Independence, the system is now perceived as a means to 'protect' the 'indigenous' people from exploitative outsiders. In 2015 Manipur's assembly had passed three Bills to introduce the ILP system in the state. However, tribal groups in Churachandpur perceived it as an underhanded act to grab tribal land. Those familiar with the Manipur and the ILP issue, are fearing a repeat of 2015 protests, in the wake of this development. However, if the CM is seeking opinions from all the communities, it is most likely to mitigate any fallout like the one from the last time. Reviving the ILP Bill might be construed as a way to placate members of the Meitei community – who have been demanding its introduction. The Joint Committee on Inner Line Permit Sytem (JCILPS) has, of late, shot to notoriety. They have conducted ‘identification' drives where all 'non-indigenous' people are made to produce valid papers for being in Manipur. They have attacked the non-local vendors in the market places, as well as have issued ultimatums to those living in rented accommodation without 'proper papers'. All of this has been done in the name of 'protecting the indigenous culture of Manipur'. The organisation has been at the forefront of the plan to introduce the ILP system in Manipur. It would be relevant here to see how this demand originated. 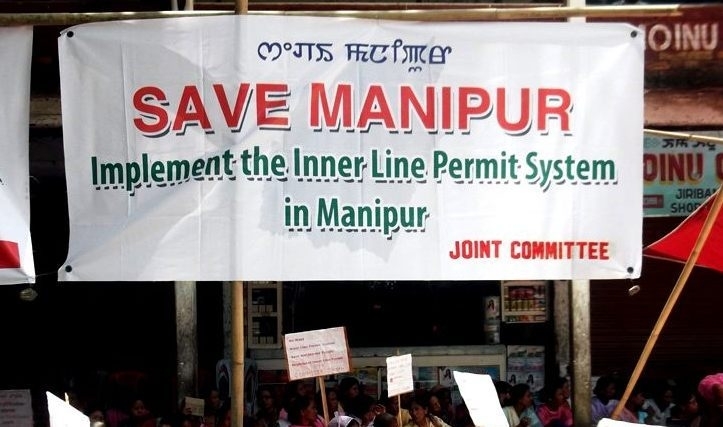 Manipur – before its 'merger' with the Indian Union – had a permit system in place till 1950. In 1950, the system was withdrawn by Dewan Major General Rawal Amar Singh. In 1960, Parliament passed the Manipur Land Revenue and Reforms Act, which brought the valley under the modern land revenue system. The hills, being designated as 'tribal areas', were insulated from the settlers, but the valley saw a large-scale in-migration from other parts of India. The in-migrants were able to purchase the immovable property in the valley, as the restrictions were lifted then. The valley in Manipur constitutes around 10 per cent of the total area in the state and has around 65 per cent of the total population. It may noteworthy that the Meitei insurgencies did not begin till the 1970s and 80s. Though introduction of the Act was probably not the sole reason behind the insurgency, it may have been a contributing factor. At the time, however, statehood and a representative government were the main concerns, till the state was created in 1972. The present issue has a more recent origin. It all began after the groups in Meghalaya started agitating for the introduction of the ILP system in the state. Assam and Manipur soon followed the suit. While the issue has remained mere a political talk in the other two states, in Manipur, it has been a highly charged issue. In 2015, three Bills were passed in the state assembly – the Protection of Manipur Peoples (PMP) Bill, 2015, the Manipur Land Revenue & Land Reforms (MLR&R) (7th Amendment) Bill 2015 and the Manipur Shops and Establishment (MS&E) (2nd Amendment) Bill 2015. Almost immediately after they were passed, protests against these amendments broke out in Churachandpur. Arson and vandalism ensued, resulting in the death of nine civilians. It is not certain whether all those killed were indeed protesters. The protesters perceived the Bills as 'anti-tribal', as they feared that this would enable the Meiteis to acquire the tribal land – something the hill people had been insulated against. However, according to people who had actually read the contents of the Bills, the existing land relations between the valley and the plains would be unaffected. If anything could have pointed to the Bills being anti-tribal, it would boil down to two aspects. One is that the Bill had defined Manipur people as those who are mentioned or descended from those mentioned in the 1951 census. There may have been some people of the hills whose names might have been either left out or not entered properly in the census at the time. The other irritant could have been that the Hills Advisory Council (HAC) was not consulted before the Bills were tabled, though it is Constitutionally mandated under Article 371C. The present circumstances appear communally charged; a predominant demand for ILP in the valley is met with suspicion from the hills. Apart from the hill communities, the other community that is apprehensive of these developments is the Gorkha community. It has been a part of Manipur before the British expressed their 'suzerainty' over the kingdom following the 1891 Anglo Manipur War. The community had first entered Manipur after the King raised a force to fend off Burmese attacks. The apprehension of the Manipuri Gorkhas is that the ILP issue may just be a ruse to displace them. The challenge for the government in Manipur will be to pass the Bills without alienating any of the people who call Manipur their home.